My sister’s kitchen has been driving me mental for the last 2 months! Every time I opened a cupboard door I was in fear of a head injury from jars and tins “jumping” out to get me. Because I am such a great sister I offered to lend (yes lend not give) her my store cupboard Tupperware. For those in the know Modular Mates. 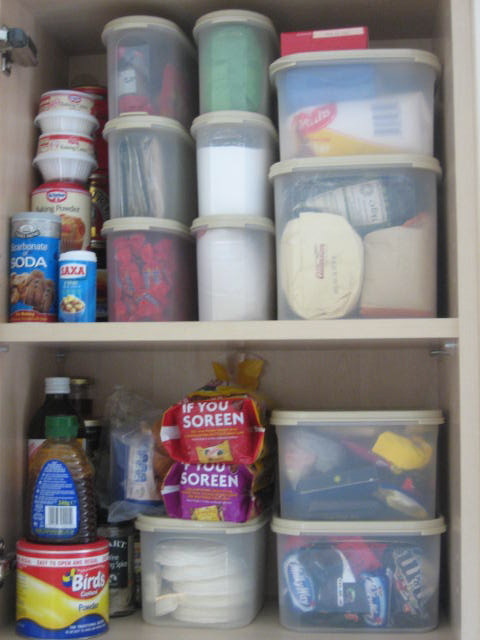 I spent hours arranging Fiona’s cupboards yesterday and took photos so that you all could see how hazard free her kitchen is now. Well done me. I slept like a baby last night dreaming of organised cupboards. The cookbooks and Tupperware has arrived…. Well today was a big day for me, my boxes have arrived from Sydney. My ma and pa kindly offered to assist me with the collection of all my worldly belongings (condensed to 7 large boxes) which is mainly made up of kitchen equipment. I know you are surprised at that….tee hee. I just don’t know where to start with how excited I am about the arrival of this bounty. For anyone who knows me I suppose I should start with the Tupperware. I have A LOT of Tupperware which I am fiercely protective of. Now I don’t mean “plastic boxes” I mean the real deal old-fashioned pyramid selling stuff. Trademarked and everything! My passion for Tupperware runs very deep. A friend on mine hosted a Tupperware party at her home a few years ago desperately wanting the “free gifts” promised, unfortunately she would only receive these free gifts if she could get two of her guests to agree to also host a Tupperware party. Me being a total sucker agreed to host one, however at the end of the day she hadn’t managed to get anyone else to agree to having another party so I was strong armed into having not one but two Tupperware parties – double sucker!! The parties turned out to be great fun, a fantastic excuse to invite all my favourite people to my place and cook for them. I managed to sell so much Tupperware I ended up being the largest party in NSW during record breakers week. I am not sure whether to be proud of that or embarrassed (that won’t be going on my CV). Due to my Tupperware success I received a ton of free Tupperware (and I bought a lot too). So now I cherish my extensive collection of Tupperware, and much to Adam’s distress I brought the majority of it with me. Hence the excitement regarding the arrival of my boxes. My sis will be equally excited as I have promised to lend (yes that is lend NOT give) my Tupperware to her until I need it. 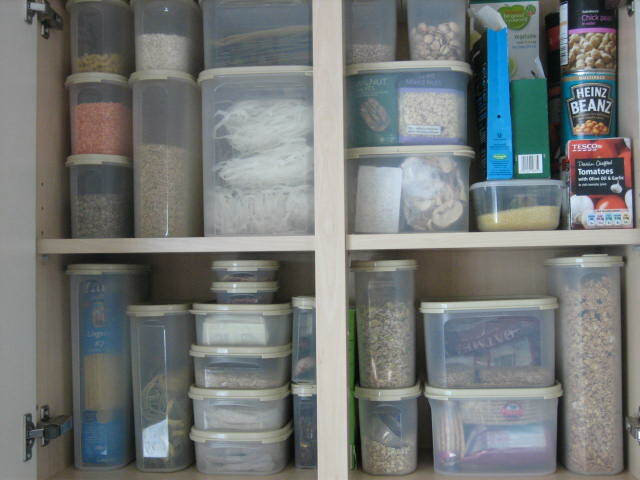 I have also agreed to re-organise her kitchen so that you can open her cupboard doors without fear of cracking your skull with falling tins, jars or packets (using the Tupperware of course – Modular Mates for those in the know). Stephanie Alexander’s “The Cooks Companion” – this is the cooking Bible and I really recommend anyone interested in cooking to invest in this. It is not cheap, around AUS$130, but well worth it. Kylie Kwong “Simple Chinese Cooking” – this book is exactly what the title suggests apart from it doesn’t say delicious and fresh (which it is). Additionally it is important to note the food is nothing like the scary stuff that comes from your local Chinese. There is not a prawn cracker in sight and no slime sauce (sauces thickened with corn flour). I have lots of other fab cook books but these are my favourites. So many recipes so little time!